It's not often I post something specifically directed to our LDS readers, but I just felt like this was something that needed to be said, and it can probably apply to those of other faiths as well. For years I've been hearing a lot of people (women especially) calling themselves black sheep in the LDS Church, saying they don't "fit the mold" or that they aren't really the "Relief Society type." And the fact that you think there is a type is what's keeping you from feeling like you belong. Despite what you might think, the Lord's flock isn't made up of white sheep. It's made up of white, black, red, yellow, orange, green, and blue sheep. Pink and purple ones, too. Spotted sheep, striped sheep, bald sheep, pretty sheep, ugly sheep, even sheep that look like goats! It's made up of every kind of sheep you can imagine. I have been a member of the Church my whole life. I was raised in it, baptized when I was eight, and never had any period of inactivity, been faithful and true my whole life. There are many converts who might say, "See, you've been active in the Church your whole life- you've never drank or smoked or even cursed! You don't have tattoos, you've had all these leadership callings- how in the world could you understand me?" Okay, how would one of those converts feel if I said to them, "See, you haven't been in the Church your whole life- you've drank and smoked and cursed! You have tattoos, you've never held a calling- how in the world could you understand me?" It's the exact same opinion given from two different perspectives, yet each is equally harmful. The convert's opinion is perceived as complimentary while the lifetime member's opinion is perceived as derogatory, but the truth of it is that both opinions are devised to separate, to create division, to dig a gulf between us. Is that what the Lord wants for His Church? No. But guess who does want that for the Lord's Church? Whenever you find yourself wanting to step into your black sheep role, take a step back and consider where those ideas are coming from. Do you think God is happy when you shy away from church activities because you're not a "Molly Mormon"? Do you think He enjoys hearing anyone in the Church sitting around talking about 'us versus them'? Were the people of Zion a Zion people because they were 'all of one past, and one experience, and dwelt in the same kinds of families, and there were no tattoos among them'? No, "the Lord called his people Zion, because they were of one heart and one mind, and dwelt in righteousness; and there was no poor among them." "The Church is not an automobile showroom—a place to put ourselves on display so that others can admire our spirituality, capacity, or prosperity. It is more like a service center, where vehicles in need of repair come for maintenance and rehabilitation. Maybe you walk into church with your ink showing, or maybe you don't know how to bake a loaf of bread, or maybe you're a single mom working two jobs, or someone who doesn't really want to oppose gay marriage, or maybe you chose to focus on your career rather than get married and have children- do any of these things mark you as a black sheep? No. They mark you as a human being who just walked into church, which makes you a human being who loves God and is seeking to learn and grow and follow Him the best way you know how just like the rest of us (and FYI, contrary to popular belief, baking a loaf of wheat bread is not a prerequisite for the celestial kingdom). And if you're any of the above, please know that I love you and I welcome you. Because when I see you at church I know you are doing something that might feel scary, might be terribly uncomfortable, and yet there you are. That tells me you're brave and you're someone I need to get to know. Someone who is sticking with the flock even though it's hard. Someone who will get to learn and grow alongside me, someone who can teach me at the same time I'm teaching you: I want to see the gospel through your eyes. I welcome you with open arms and will walk with you along this path we're both taking together. And while you might not be able to see my rough edges right away, trust me, they're there. That's why I need the gospel too. But is everyone like me, welcoming you with open arms? No, they're not. Some are feeling insecure themselves, and don't think they're the best representative to welcome you into the Church, so they don't reach out. Others might feel just as intimidated by your appearance or your different perspective or your past experiences as you might feel of theirs, so they avoid you. Still others might be too distracted by responsibilities with church and family to take the time to connect with you, which is certainly a shame, but it doesn't necessarily mean they don't want to. What I'm trying to say here is that while your feelings of being left out might indeed be valid, you still own half of this equation. 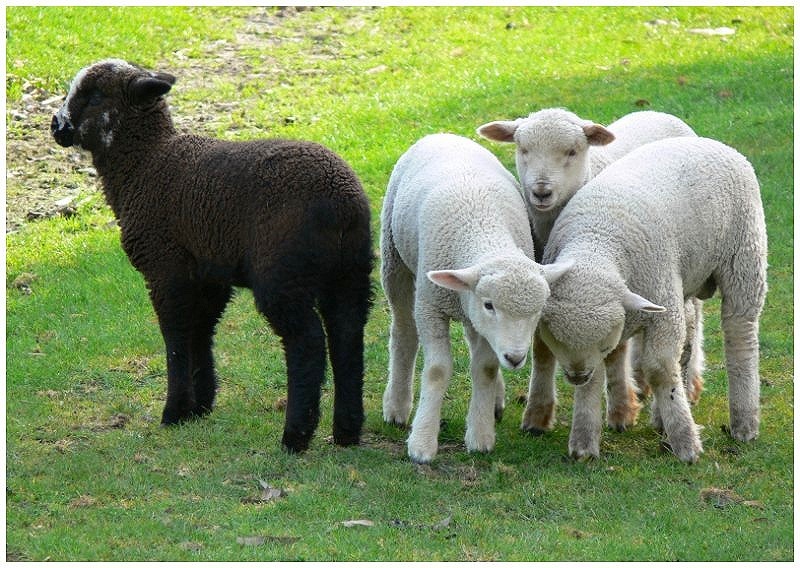 You can choose to call yourself a black sheep and live up to everyone's first impressions and stay on the outside, or you can choose to reach out and open yourself up to relationships that go below the surface- both your surface and the surfaces of others- and by so doing bring your own unique experiences and perspectives to the table and help us grow together as a Church. It's up to both of us. So black sheep, white sheep, and every-other-color-of-the-rainbow sheep, I welcome the opportunity to see this gospel through your eyes. I'm ready to embrace you in this, the Lord's flock, and I know that's what our Shepherd expects of both of us. Won't you embrace me too? *Are there some people who come to church "to be seen of men" and not because they are eager to learn and worship? Yes. Is it our job to identify and judge those people? Nope. Awesome! I'm sharing this one. You say something I think and feel often, in much more eloquent terms than I would.